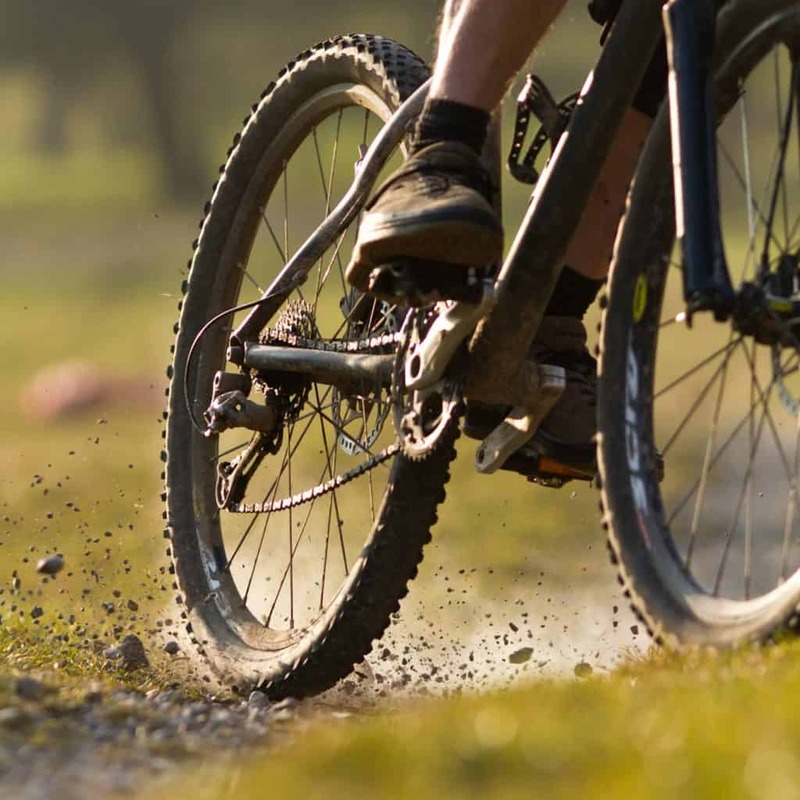 The gears on a mountain bike are intended to help the rider maintain a smooth and comfortable pedaling rhythm even in the most unpredictable terrains. For a novice to the sport, these gears might seem like complex mechanisms that you can’t figure out. 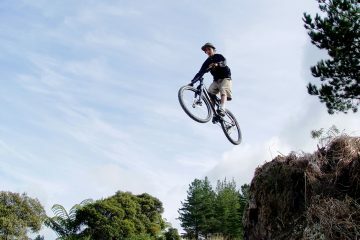 But once you learn how to shift gears on a mountain bike, this process will become less intimidating and more intuitive. Here at The Adventure Junkies, we explain both the fundamentals and finer points of gear shifting —whether you’re on a level surface, rolling gradient or steep incline. Just follow this basic guide, and soon you’ll be operating those different gear functions like a seasoned expert! The average mountain bike has between seven to 11 gears, all of which include these five main components. If you’re interested in learning more about the framework and mechanics, our guide to parts of a mountain bike is worth checking out. Also called a crankset, this part attaches to the pedals and is shaped like a round cog with serrated teeth on the edges. Most bikes have up to three chainrings which transfer the energy created through pedaling into the rear wheel. Located on the real wheel, this part resembles a group of sprockets, with the largest cog secured flush against the wheel and the smallest cog on the outside. The cassette allows for varied pedaling cadence to ensure a fluid motion. Connecting the chainrings to the cassette, this part rotates all the cogs as you pedal, forcing the wheels to move the bike forward. To understand more about the diverse types of chains and which are most efficient, our guide to MTB chains is a useful resource. Positioned on the handlebars, this part regulates movement between the chainrings, cassette and chain in order to manually change into a higher or lower gear. Each shifter is linked to one cable that operates a corresponding derailleur. Triggered by pressing down on the shifters, this part keeps the chain spinning effectively around all the cogs which make up the chainrings. Most bikes have two derailleurs, one located on the front wheel and the other on the rear wheel. Changing into a different gear happens when pressure is applied to the shifters, and these are the basic kinds mountain bikers should know about. This type of shifter is activated through two levers. One propels the chain in an upward motion, and the other pushes the chain in a downward motion. The top lever connected to one shifter places more resistance on the gears, while the top lever connected to the opposite shifter eases the degree of resistance. This type of shifter is activated by twisting an indexed clamp on each handlebar either backward or forward. The right grip shifter controls the rear derailleur. Twisting it toward you eases the pedaling resistance, while twisting it away increases the resistance. Meanwhile, the left grip shifter controls the front derailleur. Its twisting directions are opposite of the right shifter. 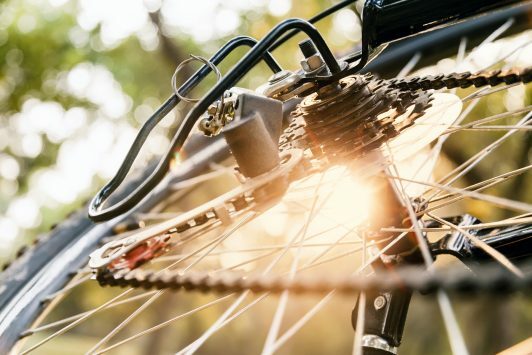 The cycling experts at Active.com recommend being strategic and anticipating the trail ahead, so you’re prepared to gradually change the gears beforehand instead of abruptly overcompensating which might cause the chain to slip from position. When riding on even terrain, shift into a middle or higher gear to accelerate and intensify your cadence. When riding on sloped gradients, shift into a lower gear to conserve energy and make the ascent less demanding on your legs. For that reason, most bikers prefer riding at a higher cadence in a lower gear versus riding slower in a higher gear. Once you’ve reached an optimal cadence, shift the gears frequently to ensure you maintain it, despite the topographic challenges you encounter. 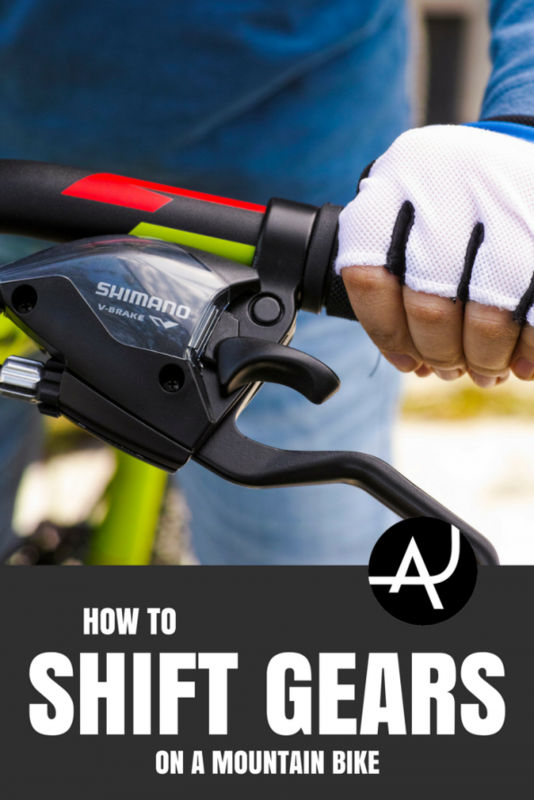 For minor tweaks, shift the chain between the rear cassette cogs, then shift between the front chainrings when it’s time for a major adjustment. Avoid operating both shifters simultaneously because this could exert too much tension on the chain, forcing it off-track. As you change the gears, alleviate pressure from the pedals and click into one gear at a time rather than speeding through several gears hastily. As a quick reference point, keep in mind these suggestions from Bicycling.com: If you’re riding uphill or into headwinds, shift into the small front chainring and large rear cogs. If you’re riding downhill, shift into the large front chainring and multiple rear cogs. Finally, shift into the small front chainring and small rear cogs if you’re riding on a flat surface. When the chain is precisely aligned with the derailleurs, the cassette and chainrings will rotate efficiently, making your ride both smooth and successful. However, if the chain becomes slanted due to haphazard shifting, this will cause strain on the entire gear framework. The chain should be linear to the teeth and sprockets of each cog which distributes pressure equally throughout the cassette and chainrings. So if the chain slips, torques or wraps around these mechanisms, it will damage the functionality over time. Prevent this cross-chain issue by selecting gears that keep the chain in a straight line between the cog and chainring. Don’t choose gears that force the chain to stretch between two large cogs or two small cogs. If you suspect the chain might be deteriorated from this wear-and-tear, Active.com recommends measuring between the central rivets of 12 chain links. The distance should be around 12 inches, so you’ll need to replace the chain if it has lengthened over one-sixteenth of an inch per that one-foot benchmark. In the world of mountain biking, safety is essential. So, you should take this precaution seriously and make sure all hardware is in working order for each ride. Mary-Elizabeth Schurrer is a freelance writer, natural health enthusiast, self-described bohemian and lover of the outdoors. Her passion for staying active has led to various pursuits from running to cycling to hiking and more. She currently lives on the sunny Florida Gulf Coast and believes everything is better beachside. When she’s not wanderlusting or planning her next off-the-grid adventure, Mary-Elizabeth blogs at Health Be a Hippie where she posts about all things wellness.